RØDE Microphones has announced the release of the smartLav, a new lapel microphone that connects directly to the headset jack of Apple iOS devices. Compatible with the iPhone, iPad and iPod touch, smartLav delivers premium quality audio capture in a compact and accessible form factor. iConnectMIDI2+ and iConnectMIDI4+ reinvent what it is to be a MIDI interface by introducing new technology and combining preexisting technologies in an intuitive way. iConnectMIDI2+ is not only a 2 in 2 out MIDI interface for PC, MAC, and iOS. It also introduces two exciting new features to enable musicians to professionally integrate more than one computer or an iOS device into their music making environment. The first of these technologies allows for more than one computing device to access the same MIDI resources. This is useful in many ways such as, sending midi from a controller or synth to daw and an iOS device simultaneously, setting up redundancy in a live MIDI environment, sending MIDI from multiple computing devices to one another, and more. iConnectMIDI2+ also features Audio Pass-through. This patent pending technology is integral to using iOS, and multiple computing devices (Mac, PC, and iOS) in a professional environment by enabling the devices to pass not only MIDI data but also audio data from device to device. There are many practical applications for this technology, for example now musicians can use a DAW on their MAC or PC to control a virtual instrument or other music making program on their iOS or other computing device (PC, MAC, iOS) and send the MIDI data as well as audio data back to the DAW without extra cables, or signal degradation or additional analog to digital conversion. With all of this connectivity comes possibility and nearly endless options. iConnectivity’s Port Manager software for Mac, PC, and iOS allows the user complete control over how MIDI is routed, remapped and filtered to and from all devices connected to it. iConnectMIDI2+ delivers so much more than just a standard 2×2 MIDI interface even though it is at a similar price point. It is a fantastic option for any musician looking to integrate more than one computing device, iOS, or just looking for the most flexible 2×2 MIDI interface in the world. You want freedom, and not just a little… but, total freedom. The iX16 Digital Mixer gives you the freedom to work wirelessly from anywhere in the venue using basically any device you have—be it iPad or iPad mini, tablet PC, laptop or Mac computer. Our public OSC protocol will even allow developers to work on their own apps for Android devices. Want to hear the mix in the balcony?Or, maybe the bass player wants you to help him sort out his monitor mix. With the iX16 you have the freedom to roam about and experience all elements of the main mix from any vantage point—just grab your iPad and get moving. And you can mix monitors where they’ll do the most good,right in the sweet spot on stage. Better yet,since iX16 supports being controlled by several remote devices concurrently,why not give each band member control over their own monitor mix?! The iX16 inherits the X32’s remarkable processing as well as the fully programmable mic preamps you’ll find inside. But don’t be afraid, it also commends itself to the rather less experienced user, by focusing on a simple, streamlined workflow that can easily be grasped. The iX16 provides serious connectivity, including a bi-directional 18-channel USB audio interface for live recording, home or project studio enthusiasts looking for a major step up in quality. Add to this a 40-bit digital mix engine that will take your music to a whole new level of sonic clarity, ULTRANET connectivity for our P16 Personal Monitoring System, and we’ve just scratched the surface of the iX16’s amazing feature set. Perfect for permanent installations, just connect your mics and speakers, grab your iPad—and fly! Professional gear—professional solutions—the iX16 Digital Mixer from BEHRINGER! Cumberland, R.I. (January 24, 2013) – Alesis, the world’s fastest-growing electronic drum brand, announces the DM Dock Kit and the DM7X Kit, two innovative new electronic drum sets. Alesis will exhibit the DM Dock Kit and the DM7X Kit at Booth 6700 at the 2013 NAMM show, January 24-27 in Anaheim, California. The DM Dock Kit is a six-drum, four-cymbal drum set based around the DM Dock, a revolutionary drum module for iPad unveiled by Alesis in 2012. The set features four toms, a snare, the Alesis StealthKick drum trigger, a hi-hat, two crash cymbals with choke, and a three-zone ride cymbal with choke. The DM Dock Kit’s rugged steel rack is instantly adjustable with hinged quick-release clamps holding the drum pads and integrated cymbal arms that are easily converted in seconds from boom-style to straight. Building upon the widely acclaimed design of the Alesis iO Dock, the DM Dock drum module harnesses the power of iPad for drummers, giving them a stage-ready device with 13 professional trigger inputs and balanced ¼” stereo main outputs. Thanks to the WiFi, Bluetooth®, AirPlay®, and 3G wireless connectivity of iPad, the DM Dock empowers drummers to change and enhance their sound library at a moment’s notice. With a compatible app, drummers can download new drums, cymbals, even a complete kit to suit any musical style or venue. Alesis will exhibit the DM Dock Kit along with DM Touch, a percussion app specifically designed by Alesis for the DM Dock. The app allows drummers to create new kits in seconds by simply dragging and dropping drum icons onto a virtual drum kit. Alesis will also exhibit the DM7X Kit, a premium six-piece electronic drum set. With its ultra-quiet rubber drum and cymbal pads, the DM7X Kit is ideal for professional drummers who want an electronic kit for quiet practice or for electronic percussionists looking to upgrade to a higher-quality kit with a professional module. The DM7X Kit features four 8” dual-zone toms, an 8” dual-zone snare, the Alesis StealthKick 2 compact drum trigger, a 10” hi-hat, a 10” crash cymbal with choke, and a 10” ride cymbal. The DM7X module is the newest module from Alesis and comes with 385 drum and percussion sounds arranged into 40 vintage and modern kits. iPad and AirPlay are trademarks of Apple Inc., registered in the U.S. and other countries. Bluetooth is a registered trademark of Bluetooth SIG. IK Multimedia is proud to announce iLoud®, the first portable stereo speakers designed for musicians. IK leveraged its 16 years of pro-audio engineering expertise, and its experience as the leading developer of mobile music-creation apps and accessories, to design battery-operated speakers that combine superior power, pristine frequency response and amazing low end in an ultra-portable form factor that make them the perfect alternative to studio speakers for music creation and composition on the go. The iLoud line consists of two models, iLoud and iLoud MINI, both of which provide musicians with sonic accuracy that’s on par with professional studio monitors, making it possible, for the first time, to compose, record, and mix from a mobile speaker system. Despite their diminutive size, both iLoud speakers are indeed very loud. In fact, they’re 2 to 3 times louder than comparable size speakers. The iLoud model offers a blasting 40W RMS of power, and it’s little brother, iLoud MINI, a robust 12W RMS. Both iLoud models provide highly accurate reproduction of a wide range of musical styles from rock, hip-hop and electronic dance music, to more nuanced and sonically demanding genres like classical and acoustic. The speakers are equipped with onboard DSP, for maintaining accuracy and efficiency at all volume levels, and high-quality, custom-designed neodymium loudspeakers. 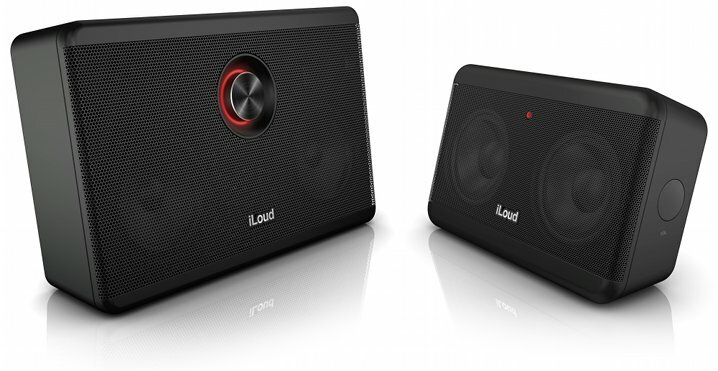 iLoud is equipped with a bi-amped 4-driver array, and iLoud MINI with a pair of full-range speakers. The enclosures feature bass-reflex and passive radiators construction, which helps create their superior bass response, with tilted profile for perfect listening position. iLoud also offers the possibility to connect a guitar, bass or dynamic microphone directly to the speaker and process the sound with a multitude of real-time effects apps. Featuring the same circuitry as IK’s iRig – the most popular mobile interface of all time – the input allows users to plug in an instrument and access AmpliTube or other audio apps on their mobile device for practising, performing and recording. The input also accommodates dynamic microphones, making it possible to run an app such as IK’sVocaLive for realtime vocal effects and recording. In addition to their impressive response, volume, and features, the iLoud speakers are surprisingly small, exceptionally portable, and can be used everywhere. iLoud MINI, the smaller of the two, is only about the width and height of an iPad mini while iLoud has the size of an iPad. Only 6cm / 2.3″ thick, either model can easily fit in a laptop bag or backpack. Both iLoud and iLoud MINI are also equipped with a high-performance Li-Ion rechargeable battery with smart power-management features that reduce its power consumption, making possible to go long periods without recharging, an important factor for mobile users. Both iLoud models support Bluetooth operation, which adds even more to their mobility. Users can stream music to them from any compatible mobile device such as an iPhone, iPod touch or iPad for casual listening. For sound sources like MP3 players that don’t have Bluetooth capabilities, the iLoud speakers each have a stereo 1/8″ mini-jack input for connecting line-level devices such as home stereos, DJ gear, mixers, MP3 players, and more. iLoud will be priced €239.99 and iLoud MINI €159.99 (ex. VAT) and they will be available in the second quarter of 2013 from the IK network of music and electronic retailers around the world. 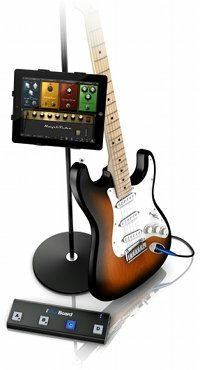 IK Multimedia – the leader in mobile music-creation apps and accessories for iPhone, iPod touch and iPad – is proud to announce iRig® BlueBoard, a groundbreaking new Bluetooth MIDI pedalboard for iPhone, iPad and Mac, which gives guitarists, bassists and keyboard players hands-free control of mobile and Mac music apps. Winner of the iLounge “Best in Show” at the recent CES (Consumer Electronics Show in Las Vegas), iRig BlueBoard is a great addition to any mobile or studio rig for live performance and recording. Guitar players, vocalists and keyboard players can use it to extend control of their preferred music apps by switching presets, changing sounds or modifying effects parameters – all hands-free. They don’t have to put down their instrument, and can remain focused on their performance. Any music app or software that is MIDI compatible (the standard communication protocol for musical instruments) – such as IK’sAmpliTube, VocaLive, SampleTank, iGrand – or any other Core-MIDI-compatible app like Apple GarageBand, can be operated wirelessly with iRig BlueBoard. This ultra-portable unit uses Bluetooth 4.0 technology to transmit the actions of its four onboard, backlit footswitches and its two optional external pedals to the mobile device or Mac. Then using the included iRig BlueBoard app and software, the Bluetooth signals are converted into MIDI messages and routed internally to the music app that’s running on the device.It’s also possible to fully customize the MIDI messages that are sent out by the four switches and two optional expression pedals. It’s easy to setup iRig BlueBoard to control patch changes, effects parameters, reverb, delay on/off – or any parameter that can be controlled via MIDI. For a guitarist or vocalist using a mobile multiFX app like AmpliTube or VocaLive as a sound processor, iRig BlueBoard provides the foot-controlled functionality and convenience of a pedalboard, but with a form factor so compact and portable that it can easily slide into a backpack, a laptop bag or an instrument case.Because it’s wireless, iRig BlueBoard lets musicians setup onstage without being tethered to their mobile device. The unit’s range is 10 meters (over 32 feet), giving musicians a great deal of mobility to roam the stage that would be impossible with a wired unit. Because the footswitches are backlit, they’re easy to see in all lighting conditions, even on a dark stage. Additionally, the fact that iRig uses wireless Bluetooth leaves all the wired ports of the device free, so they can be used simultaneously by interfaces or controllers that feature the 30-pin or Lightning connector, like IK’s iRig HD, iRig MIDI or iRig KEYS, and adapters or microphones that use the device mini-jack such as iRig or iRig MIC. 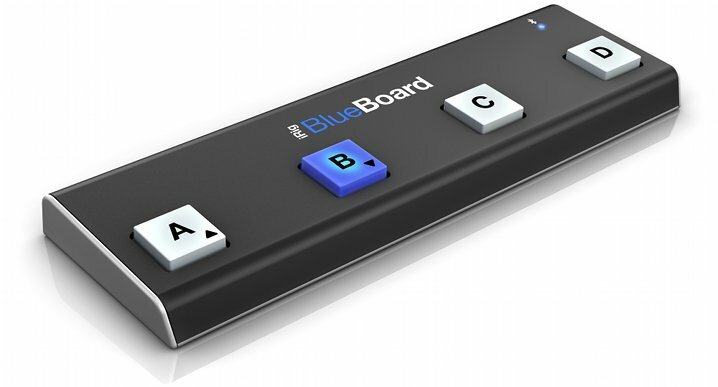 Even with all its impressive functionality, iRig BlueBoard measures only 27cm wide x 9cm deep (10.6″ x 3.5″). It’s extremely lightweight, but with a sturdy, stageworthy chassis and four footswitches made of soft-touch rubber and designed for durability. Because of its ultra-low profile (it’s only 2cm / 0.8″ tall) the unit can easily fit on a desktop. For total portability, iRig BlueBoard is battery powered. It takes 4 standard AAA batteries, and because it uses Bluetooth Low Energy (BLE), it draws very little power, leading to extremely long battery life. iRig BlueBoard is priced at €79.99 MSRP (ex. VAT), and will be available in the second quarter of 2013 from the IK network of music and electronic retailers around the world. Following the recent announcement of Rode’s upcoming professional stereo microphone for the latest iOS devices, comes Samson Tech’s own impressive looking, high quality stereo microphone! Finally, your iPhone videos will sound as great as they look. With Zoom’s iQ5 Professional Stereo Microphone, you can turn your iPhone, iPod touch or iPad into a high-quality stereo recorder. Featuring an adjustable mic element with both vertical and horizontal positioning, the iQ5 lets you capture amazing sound wherever you go. The RØDE iXY is the ultimate recording microphone for iPhone® or iPad®. With up to 24-bit/96k* recording and on-board high-fidelity A/D conversion, your iXY recordings are rich, smooth and accurate. This results in immersive and true-to-life stereo recordings, captured in incredibly high detail. The iXY is compatible with iPhone® 4S, iPhone® 4, iPad® (3rd generation), iPad® 2 & iPad®. January 8, 2013 – IK Multimedia – the leader in mobile music-creation apps and accessories for iPhone, iPod touch and iPad – is proud to announce five new accessories in its popular iKlip™ mounting solution line up: iKlip 2 for iPad and iPad mini, iKlip Standfor iPad and iPad mini and iKlip Studio now for iPad mini. iLine Mobile Music Cable Kit Announced – Ever been in a situation where you didn’t have the right cable for the job? With the iLine Cable kit, you’ll never be without options. The iLine Mobile Music Cable Kit is a complete collection of 6 high-quality audio cables, designed to provide users of smartphones, tablets, MP3 players and laptops with the tools they need to handle virtually any signal routing and audio-cabling situation. iRig HD Announced – iRig HD improves on the characteristics that have made iRig the standard for connecting your guitar or bass to the iPhone, iPod touch or iPad and rocking out. Together with its ease of use, plug-and-play convenience, ultra-portability and universal compatibility, iRig HD offers a superior digital sound quality that’s comparable to that of high-end interfaces used in computer-based studios. Las Vegas, NV — January 6, 2013 — Griffin Technology, one of the world’s foremost creators of innovations for everyday life, is rolling out new music accessories for iOS, including the StudioConnect with Lightning, DJ Connect, Mic Stand Mount and MicConnect at CES. Leading the lineup is StudioConnect with Lightning, Griffin’s popular all-in-one audio interface for music creation on the iPad, now compatible with the new iPad (4th generation) and iPad mini. StudioConnect provides connectivity for guitars, stereo audio, MIDI-In and MIDI-Out as well as a Lightning charging dock in one compact device. It also features line-level RCA stereo output and stereo headphone output with separate volume control. With StudioConnect, digital music-making has never been easier, combining both audio and MIDI (Musical Instrument Digital Interface) recording into one convenient accessory. Audio In – Plug instrument in through a mono 1/4″ jack or plug a mixer into StudioConnect’s stereo 1/8” (3.5mm) jack. Audio Out – Left and right line-level RCA plugs. The 1/8” (3.5mm) stereo headphone jack, with its dedicated volume knob, helps monitor what’s going in and out. MIDI In – Connect a MIDI controller through a standard 5-pin DIN MIDI-in port. MIDI Out – A second 5-pin DIN connector accepts a sequencer, patch bay or other MIDI gear, allowing the iPad and MIDI apps to act as a MIDI controller. The updated StudioConnect with Lightning, $149.99, will be available Spring 2013 from select retailers. Similar to Griffin’s best-selling DJ Cable, the new DJ Connect offers DJs a way to pre-cue their music and beat-mix. Designed specifically to work with algoriddim’s award-winning djay and vjay apps, the DJ Connect allows user to have the ultimate mobile DJ experience. DJ Connect has the added benefits of volume control, dual separate stereo outputs and detachable cables for use with iOS devices with 30-pin dock connectors and Mac computers with USB ports. Compatibility with Lightning devices is planned as well. Simply plug headphones into the headphone port and connect external speakers to the RCA line level stereo outputs in the back. When connected properly, the sleek yellow glow underneath the volume knob will illuminate to provide ambient light for those DJs spinning in the dark. DJ Connect is compatible with algoriddim’s djay and vjay apps for iOS and Mac computers and will be available in May 2013 for $99.99. Griffin’s Mic Stand Mount for iPad, $39.99, easily screws onto a standard microphone stand enabling users to raise and lower the iPad to the perfect height. Fully adjustable, the Mic Stand Mount rotates and locks into either portrait or landscape view, and tilts up to 90 degrees. To protect the iPad, rubber inserts securely grip the device on all four sides holding it in place without blocking the controls, dock connector or audio jack. Compatible with all full size iPad models, Mic Stand Mount is now available at http://store.griffintechnology.com/mic-stand-mount-for-all-ipads. Lastly, Griffin introduces MicConnect a microphone interface for iPad, iPhone and iPod touch. Intuitive to use, simply connect a mic to the XLR input on the MicConnect and plug the 1/8” (3.5mm) audio cable into an iOS device’s headphone jack and launch GarageBand or other compatible apps to get rocking. MicConnect’s phantom power feature even accommodates studio microphones for high-quality recordings. Not only compatible with microphones, MicConnect also makes it possible to record amplifiers, acoustic instruments, and more right into GarageBand. MicConnect retails for $39.99 and will be available in June 2013. Griffin’s music-making accessories will be showcased at Griffin’s booth at CES 2013 in Las Vegas. Visitors can stop byLVCC Booth #5212 in North Hall, for a full demo.